WALCOTT, DEREK [ALTON] (1930-2017). 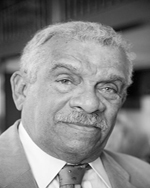 Winner of the 1992 Nobel Prize in literature, Derek Walcott identifies in his life and work two primary inspirations: the Caribbean Sea and his mixed-race heritage. Born and raised in the harbor city of Castries, St. Lucia, grandson of two white men and two black women, Walcott was from birth immersed in the patois and simple life of the island fishermen. Walcott also enjoyed a privileged British education in St. Lucia and at the University of the West Indies in Jamaica that steeped him early and thoroughly in the classics. He lived in Trinidad for many years, directing the Trinidad Theatre Workshop from 1959 to 1976. He has since divided his time among Boston, New York City, and St. Lucia. Both a poet and a playwright, Walcott has called the Caribbean the “theatre of the sea” and conceived the mission of his theatre company to produce Shakespeare and sing calypso with equal gusto. The sea is only an occasional focus of Walcott’s drama. The Sea at Dauphin (1954), a one-act play that Walcott acknowledged to be modeled on John Millington Synge’s Riders to the Sea (1904), centers on two ragged fishermen, Afa and Gacia, preparing their rowboat for the day’s work. An old, drunken peasant, Hounakin, a recent widower, begs to go with them but is refused because Afa believes he wants to drown himself. Later, the fishermen return to a chorus of women on the beach singing a dirge for Hounakin, who has leaped off high rocks into the sea. Daniel Defoe’s Robinson Crusoe (1719) had a profound impact on Walcott in its theme of a shipwrecked sailor who adapts to island life. Crusoe’s appraising gaze and creative possession of the island, along with his solitary despair, gave Walcott the theme for his two-person play Pantomime (1978), in which the roles of an English hotel owner in Tobago and his black handyman are both comically and tragically reversed. In Odyssey: A Stage Version (1993) Walcott counterpoints Homeric and Caribbean themes, interspersing Odysseus’ protracted wanderings with commentary by the blind singer Billy Blue. Proteus, the Old Man of the Sea, ghosts, and mermaids are among the cast. The Star-Apple Kingdom (1979) contains, with the exception of Omeros (1990), Walcott’s most famous and most autobiographical sea poem, “The Schooner Flight.” Shabine, the speaker, is a seaman, a poet, and a reprobate, cast out of his native Trinidad but voicing, with Walcott, ambiguity about his mixed-race heritage, a fierce love for the physical beauty of his island, and a profound and essential affinity for the sea. In the same volume, “The Sea Is History” extols the sea as first principle of civilization and memory. “The Lighthouse” and “A Latin Primer” in The Arkansas Testament (1987) evoke both the frigate bird and language of the sea, seminal ideas that return in Omeros (1990). “Gros-Ilet,” “The Whelk Gatherers,” “The Light of the World,” and “Oceano Nox” in the same collection are lyrical celebrations of his Caribbean Sea and people. Images of sea creatures and the ocean infuse newer poetry collected in The Bounty (1997). Painting the Caribbean Sea is discussed in his essay “On Hemingway” (What the Twilight Says: Essays ). This entry was posted in W and tagged male, video. Bookmark the permalink. Video: Derek Walcott reads "Sea Grapes"
Masthead image from Winslow Homer’s “The Herring Net” (1885) Art Institute of Chicago.